As a low carb person I eat berries and sometimes an apple, but fruit juice to me is just a sugar solution. Fruit itself seems to be universally regarded as A Good Thing (TM) and although Robert Lustig has said "the vehicle is irrelevant" when talking about fructose, and admits that he doesn't want to be the guy to say fruit is bad, the reliance on fibre as a moderator is somewhat optimistic. An apple or orange is a mass of insoluble fibre soaked in juice which contains soluble fibre, so the composition of a whole fruit is very close to that of its juice, from a nutritional perspective. Nutritiondata.com says one orange yields 86g of juice with 7.2g of sugar and 0.2g of fiber, but the whole orange is listed as 131g total weight containing 12.2g of sugar and 3.1g of fiber which implies 60% extraction of the juice based on sugars and 66% based on total weight. Here we can see that the blood sugar impact of eating 60g of carbs in a whole apples, apple puree or apple juice is essentially the same for the first 40 minutes. 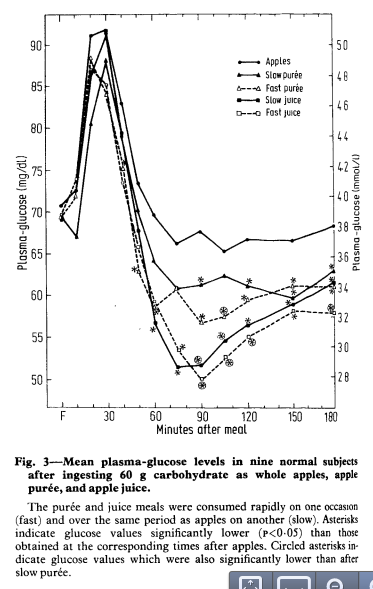 Lustig's hypothesis that "the fiber slows down the absorption and allows the liver time to catch up" is clearly BS. 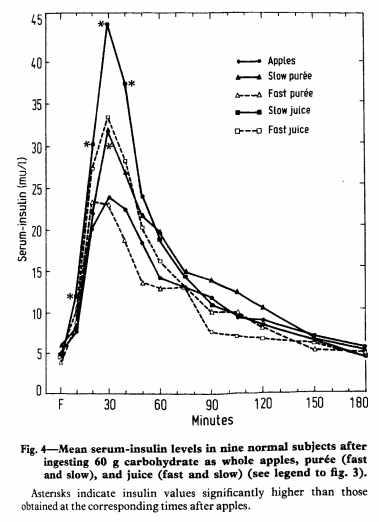 The slow puree and slow juice data is where the rate of consumption was matched to that of eating the whole apple. Ref: "Depletion and disruption of dietary fibre. Effects on satiety, plasma-glucose, and serum-insulin", Haber GB, Heaton KW, Murphy D, Burroughs LF., Lancet. 1977 Oct 1;2(8040):679-82. Juice elicits a greater insulin response than whole apples above, with consequential drop in blood glucose. Another study confirms this effect in apples and oranges although grapes behaved in the opposite manner with whole grapes prompting a larger response than juice. The take home message here is that fruit is no different to fruit juice in terms of sugar and carbohydrate composition and the fibre does not attenuate the effect on blood glucose levels. Differences in insulin response and post-meal hypoglycaemia may help with satiety but I'm not seeing a convincing case for low carb eaters or diabetics to eat fruit let alone drink fruit juice.